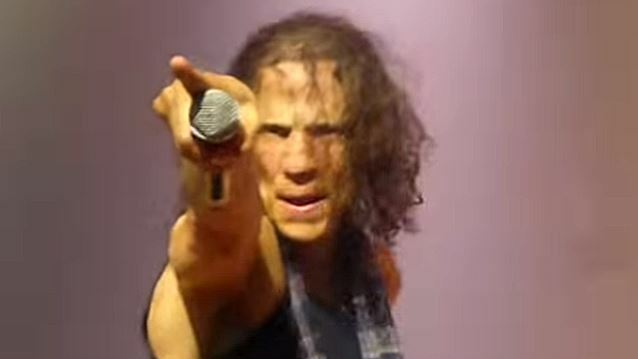 During an appearance on this past Monday's (May 11) edition of Eddie Trunk's SiriusXM satellite radio show, "Eddie Trunk Live", vocalist Gary Cherone of Massachusetts hard rockers EXTREME was asked about the band's plans to write and record the follow-up to 2008's "Saudades de Rock". "Right now, we're all feeling the pressure of putting out something new," he said. "[Celebrating the 25th anniversary of EXTREME's 1990 album] 'Pornograffitti' is great. We're enjoying it. We're playing to new audiences the past couple of years. We're hitting Russia for the first time and China. We're going to South America in June for the first time in 23 years. So all that's great. But for me, and Nuno [Bettencourt, guitar] and the guys, we're writing, we're doing demos… Now it's like… Now we've gotta get… Let's get busy. Let's get some new music out." He continued: "We're writing and demoing now, and, obviously, this summer, you take advantage of the touring season with the festivals… It's about all of us getting in a room together to record, and that's the fall. We'll find time to do it. But we'll be ready; the songs will be there." EXTREME's first studio album in thirteen years, "Saudades de Rock" (pronounced "sow-dodge") was released in the U.S. on August 12, 2008 on Open E Records and distributed by Fontana. The European version of the CD, which came out on August 1, 2008, included a bonus track, the "Americocaine" demo from 1985, the very first studio recording of EXTREME. The iconic rock foursome — Cherone, Bettencourt, bassist Pat Badger and drummer Kevin Figueiredo — recorded their fifth studio offering at NRG Studios in Los Angeles with Bettencourt at the helm as producer and mixer. "Saudades de Rock" boasted 13 tracks, including the infectious roar of "Star", the groove-laden, swagger of "King Of The Ladies", a raw funk rock anthem called "Learn To Love", and the expressive ballad "Ghost". EXTREME's "Take Us Alive" live CD and DVD came out on May 4, 2010 in the U.S. via Frontiers Records. This performance was recorded on the last night of their tour at the House of Blues on August 8, 2009 in EXTREME's hometown of Boston.